The Economic and Financial Crimes Commission (EFCC) today released the former 2nd Vice President of Nigerian Bar Association (NBA) Monday Ubani who had been detained by the Commission. 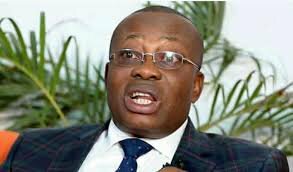 Ubani was arrested and detained on March 19, along with Senator Christopher Enai, for failing to produce the former Managing Director of Nigeria Social Insurance Trust Fund (NSITF) Mrs Ngozi Olejeme, who they both stood for as sureties. In a letter to the Nigerian authorities Lawyers for Lawyers expressed concern about the maltreatment of Justus Ijeoma by the police. It was reported that Mr Ijeoma was brutally assaulted by police officers when accompanying a client to the State Command Headquarters of the Nigerian Police in Asaba, on 26 March 2019. According to the information we received, Mr. Ijeoma was brutally assaulted by officers of the anti-kidnapping unit of the Nigerian police force when accompanying a client to the State Command Headquarters of the Nigerian Police in Asaba, on March 26th, 2019. When his client still wasn’t interrogated in the early evening, Mr. Ijeoma suggested that they would plan the hearing for the next day. The Officer-in-Charge (OC) then ordered that Mr. Ijeoma’s client would be taken to the detention room. Mr. Ijeoma objected, informed his client about her rights and refused to hand over her phone, which led to him begin slapped in the face by the Investigating Police Officer (IPO) in the presence of the OC. Mr. Ijeoma told the OC that he wanted to report to him that his officer had just slapped him, but got ignored and The OC ordered for Mr. Ijeoma’s detention too. He was then violently captured by four officers, who held him and beat him severely, tearing off his clothes. The officers chained his legs and left him in the room, which they filled with tear gas. When the officers returned and opened the door and window, Mr. Ijeoma managed to take a picture of himself with his phone by means of evidence and when he refused to hand over his phone the officers were ordered to beat him ‘professionally’ and avoid leaving any trace. Some suspected thugs reportedly beat up the chairman of the Port Harcourt chapter of the Nigerian Bar Association (NBA), Silvester Adaka and other lawyers who had gone to stage protest to disrupt court proceedings. Adaka and his colleagues had reportedly planned to disrupt the court proceedings in a bid to enforce the NBA’s court boycott directive over the controversial suspension of the Chief Justice of Nigeria (CJN), Walter Onnoghen. Daily Trust reports that angry litigants also chased the protesting NBA team out of the courtroom, causing pandemonium and heightening fear among the judges and other litigants. Dozens of lawyers took to the streets in protest over rising insecurity and the killing of one of their colleagues by armed robbers in Yenagoa, the Bayelsa State capital, on Monday. The lawyers, who are members of the Yenagoa and Sagbama branches of the Nigerian Bar Association, took what they called a ‘solemn protest walk’ through the streets of Yenagoa. Decked in black attire, the lawyers also marched to the offices of the state’s Commissioner of Police and the state’s Director of the Department of State Services to register their displeasure at the killing and declining security situation in the state in general and in Yenagoa metropolis in particular. The lawyers also tasked the security agencies to immediately bring to book, the hoodlums who murdered their colleague, Pumokumo Abel Ozi, who until his death was a member of the Human Rights Committee in the state. Ozi was killed by armed men suspected to be armed robbers on January 16, at the Opolo end of the Mbiama-Yenagoa Road, just a few metres from the Police Area Command in broad daylight. The subcommittee of the US Congress for Africa, Human Rights, Global Health and International Organizations has queried the US government on its responses to reports of repression of opponents by the government of Nigeria. During the hearing on Nigeria entitled, “Nigeria at a Crossroads: The Upcoming Elections” held on December 13, 2018, the Chairman Representative Chris Smith cited reports in the Vanguard and PREMIUM TIMES pertaining to reported freezing of Gov Peter Obi’s bank accounts as well as a raid on VP Atiku’s sons. Both men are leading opposition challengers to General Buhari. Specifically Chairman Chris Smith informed the top diplomat for Africa, Assistant Secretary of State Ambassador Tobir Nagy, that the subcommittee was in possession of a memo by the Nigerian embassy targeting a human rights lawyer for testifying before them. Concerned at the apparent repression of “opponents” of the Buhari regime, the Chairman asked the representative of the Trump administration whether the US government was engaged with Nigeria on these violations of citizens’ rights just for holding “contrary” views. The Assistant Secretary of State for Africa responded that the US embassy in Nigeria was quite “concerned” and robustly engaged on such rights violations and election malpractice as just witnessed in Osun State and gave kudos to US ambassador Symmington whom he was impressed with during his recent visit to Nigeria last month. Following the hearing, Washington-based Nigerian human rights lawyer Emmanuel Ogebe, who was the target of the Nigerian embassy referenced by the Chairman, submitted a letter to the State Department attaching the incriminating exhibit indicting the Nigerian embassy in Washington of attempting to subvert the US Congress by witness intimidation and retaliation. In the letter he called for the revocation of the diplomatic immunity of the Nigerian diplomats involved in threatening his passport and their prosecution by the US government for violations of American law.